People tend to be less productive in the winter, and it’s no surprise why. The days are dreary and cold, we forget what sunlight is like, and we yearn for the days of not needing to scrape our cars and bundle up every time we go outside. We just want to stay inside where it’s warm! Unfortunately, this can negatively affect our fitness goals and motivation. Fitness isn’t something that can put itself on hold during the winter months. It’s a routine that needs attention all year round. Our gym has the strategies you need to stay on top of your gym workouts. See how you can get back on track with Cypress Fitness, and visit our gym in McLean today! Find something new to listen to. The same playlist is going to get boring after awhile. Switch up your playlists by using recommended ones from Spotify or Apple Music, or create some new ones with workout buddies to freshen things up. You should also try moving away from music completely just to see what else is out there. Audiobooks and podcasts can be really great for helping you get into the zone. If you’re doing something more stationary, like riding a gym bicycle or running on a treadmill, you can download a favorite show or movie to watch while working out — we recommend something action-packed, like “Black Panther” or one of the newer Star Wars movies. There can be benefits and drawbacks to working out with a friend — the biggest drawback being relying on someone else as motivation for your own fitness goals. But in the cold winter times like these, it can help a lot to have someone else hold you accountable. Pick a day or two every week to meet up with a friend, and stick to it! You’re more likely to stay consistent and you’ll have more fun, too. Doing the same gym workout every time can quickly become tedious. Even though it might be harder to get outdoors right now, there are plenty of new activities you can try. Sign up for a dance class, try your hand at rock climbing, go to yoga — the options are practically endless! It’s also important to get outside during the winter, as miserable as that can sound. Go for walks, rent some snowshoes or cross country skis, or even go ice skating if you feel like it. Movement is a necessary part of life, and if you continue to make it a fun routine, you’ll feel more motivated to continue your regular workouts. I want to run twice a week. I want to hit the gym 3-4 times a week. I want to improve my bench press by ________ lbs. I want to try a different workout once a month. Sign up for a competition. Whether a competition at your local gym, a personal competition on a fitness app, or a race or triathlon, having an external motivator can be a great way to help you stay on track with your workouts. In fact, many people use competitive events as their main way to stay motivated, simply because they work out more consistently when there’s something on the horizon. Work out with a personal trainer. Sometimes you need a coach or someone in your corner to help you stay motivated with your fitness. That’s not only normal, it’s also why all athletes are able to do what they do. Having another person support you is instrumental in your success. The personal trainers at Cypress Fitness are dedicated and highly trained in helping people work towards their fitness goals. At our gym, you’ll find the motivation you need during these winter months (and beyond). 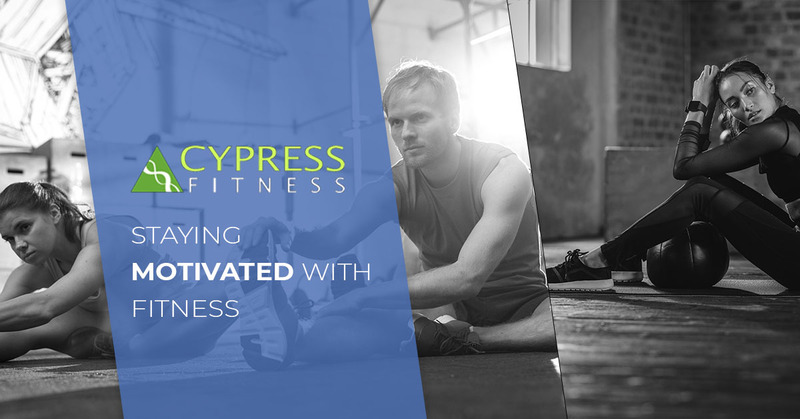 Sign up for personal training or group fitness classes with Cypress Fitness!